In the previous post, I showed you how to make your own yogurt, which is fantastic by itself, but you can take it one step up by making your own Labneh or Kefir Cheese. Labneh is a staple breakfast or dinner item in the Lebanese pantry. You drizzle olive oil all over labneh and eat it with olives, zaatar (thyme), tomatoes, cucumber and of course Arabic bread. 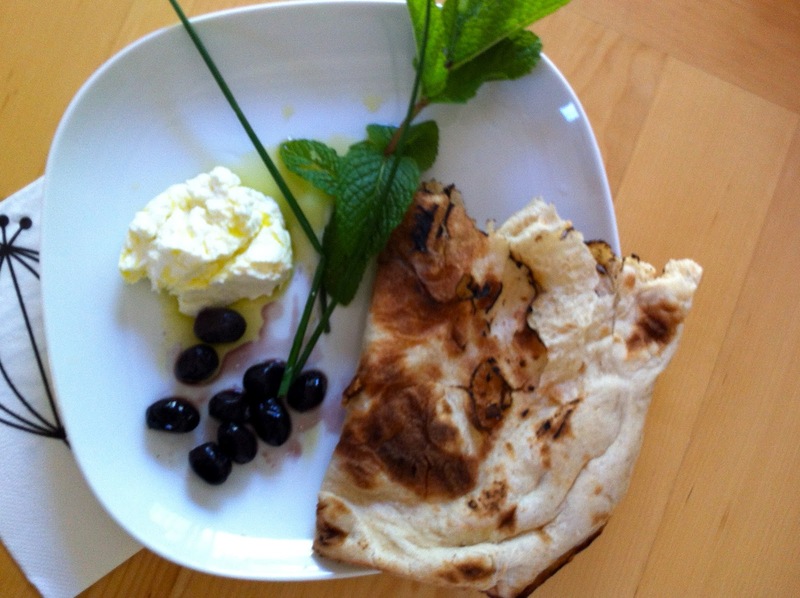 In fact, my daughter loves to eat labneh and olive on a pita bread (3arouss labneh w zaytoun عروس لبنة و زيتون). Dinner in Lebanon is traditionally as light as breakfast and it consists of labneh, a variety of cheeses, olives, olive, tomatoes, cucumber and of course flat bread. It is often served with light tea...there is something about labneh sandwich and tea, they go together very well. When we were kids we loved it when Mama made us labneh sandwich with tomatoes and cucumber, olives and green onions inside a huge rolled Arabic flat bread. We insisted "With a lot of olive oil and a lot of salt". These sandwich were delicious and the flavor was just perfect. The other day my sister visited me and I made labneh sandwiches for our daughters for breakfast. We started to reminisce about our childhood and the labneh sandwiches. We both had the same memory of asking for extra olive oil and salt. I told my sister that I always make sure that add some olive oil and a bit of salt to my daughter's sandwich and she said that she does it too. How funny! Place the colander over the bowl, line the colander with the cheese cloths or flour sack, and pour the yogurt inside the lined colander. Add a pinch of salt and stir. The salt enhances the flavor and allows for faster drainage of water or whey. The whey will accumulate in the bowl. I discard the whey. Repeat the procedure for 3 to 4 times for about 3 to 4 hours while placing concoction in the fridge. when you feel that most of whey is in the bowl and that the yogurt is now more of soft cheese texture, remove the labneh from the colander, put in in a bowl, drizzle with olive oil to preserve, cover and refrigerate. I prefer to use glass Pyrex bowl that come with their own lids. Spread the labneh over a pita bread, drizzle with olive oil and enjoy with some olives, cucumber, mint..etc..whatever your heart desires, and don't forget the tea! Thanks Dima! I just love the taste of homemade Labneh..and it is pretty easy to make! Thank you for the referral! Hi! I'm bookmarking this recipe and your homemade yogurt recipe too. I was introduced to labneh on a vacation to Dubai several years ago. A Lebanese restaurant down the street from our hotel would serve it drizzled in olive oil with warm pita bread and the most beautiful olives I've ever eaten. When I got home to Texas, I couldn't remember what it was called. After a crazy internet search to hunt down both the name of the restaurant and its menu, and phone calls to nearly every Lebanese restaurant in Fort Worth, I finally found one who made it. I was thrilled a few years later when the owner of a Middle Eastern grocery store explained to me how I could make my own by simply straining yogurt. At that time, the Greek yogurt craze had not yet begun, and my first attempt was with Dannon plain yogurt. It was terrible. Recently I've strained Fage brand yogurt. It is better, but not what I remember. I'll have to give your recipe a try. Thank you for sharing! Perhaps you could clarify something for me - I read some accounts that say that labneh must be made from kefir and others that say yogurt is acceptable. Do you have thoughts on this? Thank you! Thank you Sara for checking out my blog. We eat labneh everyday for breakfast in our home. It is nutritious and versatile. The owner of the middle eastern store is right, Labneh is indeed nothing but strained yogurt. However, the secret lies in the type of yogurt. the tangier the better it is. Labneh from goat is by far better tasting than that from cow. I am not sure if the Danon yogurt had some hidden sugar in it. The better tasting Labneh comes from homemade organic Yogurt. Check out my recipe for homemade Yogurt. Make sure to add some salt to the yogurt before you strain. it add tons of flavor and helps getting rid of water.hope that helps. PS. I like your blog too. I am learning sewing and I cant wait to make my own quilt. Thank you for the extra guidance on making Labneh. I will definitely try your homemade yogurt recipe. You take away the fear factor in making homemade yogurt! Thank you for your kind words regarding my blog. Good for you on learning to sew. If you're planning to try quilting, you are fearless! I've been making my own yogurt cheese for decades, but am getting ready to try it with kefir for the first time. But I use a Melitta coffee filter holder with a paper coffee filter in it; easier and tidier than a colander with cheesecloth. Just plop it on top of a small bowl and put it in the fridge. What a great idea! I use flour sacks which can hold a big amount of yogurt. 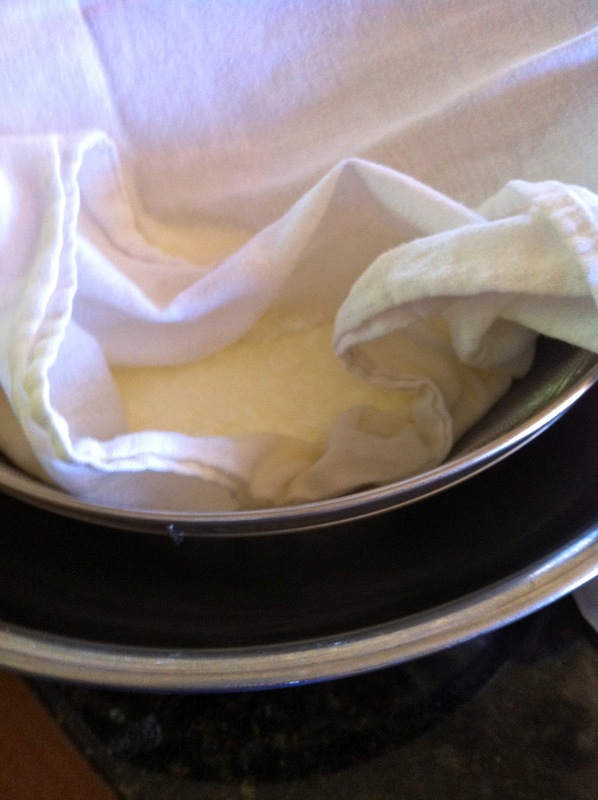 We go through so much of this kefir cheese that I make big amounts. you discards the whey!! NO way - there is so, so much you can do with whey! So Kefir is a dairy drink fermented with bacteria but few years ago I found Labneh at Trader joe's sold under the name of kefir cheese, hence the name.